Hanoi (VNA) – Vietnam has demanded China pay proper compensation for damage a Chinese coast guard ship caused for some Vietnamese fishermen when they were in Vietnam’s Hoang Sa (Paracel) archipelago. According to competent Vietnamese agencies, at 9am of March 6, when a Vietnamese fishing boat coded QNg 90819 TS with five crew members was anchoring in the vicinity of Da Loi Reef in Vietnam's Hoang Sa archipelago, a Chinese coast guard ship coded 44101 approached and fired water cannon to drive it away. 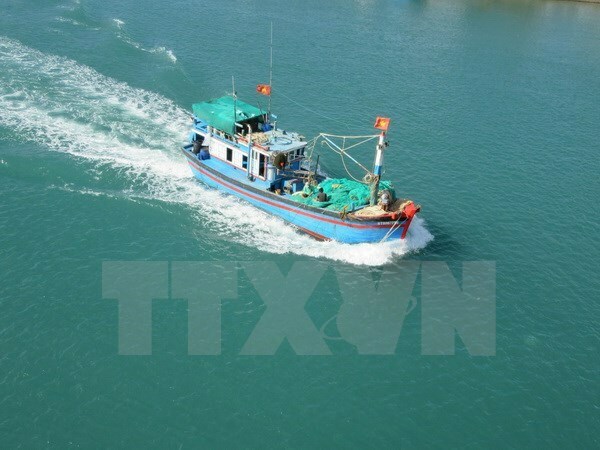 While moving, the Vietnamese boat crashed into a reef and sank at an area about 0.5 nautical mile to the northwest of Da Loi Reef at about 10am. The fishermen held on to the boat’s prow and went adrift until around 1pm the same day when they were saved by another Vietnamese fishing boat. On March 20, the Consular Department of the Vietnamese Foreign Ministry met with representatives of the Chinese Embassy in Vietnam to present a diplomatic note and protest against the Chinese ship’s action, which violated Vietnam’s sovereignty over Hoang Sa archipelago and threatened life and damaged property and legitimate interests of the Vietnamese fishermen.